2nd May 2018 | No Comments on Are You Ready for Summer? Are you ready for school to end? 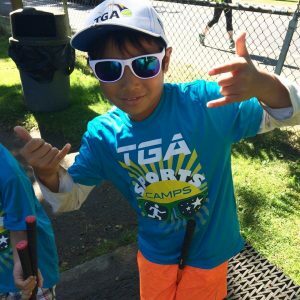 Have you checked out your local TGA program’s summer camp schedule yet? While children are counting down the days to summer, many of us still can’t believe it’s already May (where did the time go?). Don’t worry, we’re here to make sure you’re ready to hit the ground running for the start of summer break. Sunscreen, hats, and sunglasses are all recommended products to protect against the sun’s ultraviolet (UV) rays. It takes as little as 15 minutes of exposure to damage your skin, and if you’re participating in a week of summer camp, your little camper will be exposed to plenty of sunshine. TGA tip: sunscreen is just as important on cloudy days because UV rays pass through cloud coverage. If you’re planning any swimming outings over summer break, here are a few safety precautions to note. Always use a buddy system, even at a public pool or lifeguarded beach. If your child is an inexperienced swimmer, make sure they’re using a life jacket in-and-around water. Apply sunscreen (see above for sun safety). Stay hydrated! It’s easy to get dehydrated in the sun, particularly when you’re active. Make sure that children are always supervised when swimming, even advanced swimmers. TGA tip: don’t forget to reapply sunscreen! It wears off after around two hours and after swimming. Even our best plans come to a halt when the weather turns against us. The beauty of sports is that there are plenty of indoor activities available. Golf inside? Are we crazy? Nope! Take this time to work on your child’s putting by setting up different “holes” and obstacles. All you need is a few cups, a putter, and a ball. If you have a garage (or similar unoccupied space), two chairs, some rope, racquets, and balls you can create a little tennis court to play on. Make sure the net is 3’6” high in the center and you’re good to go! If you have some big marshmallows at home and a few brooms, you can create a safe, indoor hockey rink to play games on with your child. Cardboard boxes can be used as goals. A safe, indoor flag football activity that you can work on with your child is flag pulling. Make it a game by keeping score and taking turns. Balloons/beach balls can be used to practice the different hits in volleyball. Bump, set, and spike your way to a fun, indoor game of volleyball. Create a new routine while practice motions/facial expressions in a mirror. Tape two paper plates together to create a Frisbee® that’s safe for indoors. Tag @TGAPremierSports with #TGASummer2018 while wearing any TGA apparel for a chance to win a prize pack! If you plan on playing golf or tennis during the summer, make sure your junior player is properly equipped with our top-of-the-line golf clubs or tennis racquets. Go to playtga.com/shop today and get free domestic shipping. With nine teams around the country, Major League Lacrosse’s season runs throughout the summer. Click here to see if there is a team in your city that you can check out. The annual NFL Hall of Fame Game, which kicks off preseason, is on August 2 this year. If you’re not familiar with the sport, Ultimate is a fast-paced game that combines many of the most popular competitive sports. It’s a team-based sport that uses a flying disc, commonly known as a “Frisbee®” The American Ultimate Disc League is a professional league with 23 teams in the U.S. and Canada. Click here to see if there is a team in your city that you can take the family to.